I chanced upon "The Garden Slug" as the pet clinic I frequent is located right beside it. 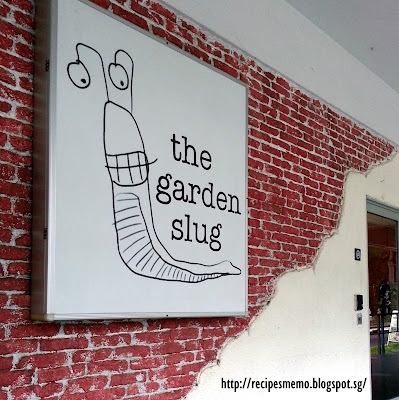 It is a small cafe that is down-to-earth and does not work much on trying to be a modern and sleek cafe that we see popping up every few months in Singapore. They have both indoor and outdoor seats. The outdoor seats are pet friendly, given that the area is saturated with pet shops, pet services and a pet clinic. However, the outdoor furniture were plastic cheap IKEA type and I felt more could have been done. We sat outside because we were unaware of available seats inside since they are located beside the "The Garden Slug" main unit. Moreover, the waiter did not mention that there was indoor seats. The service was also very poor. It was hard to get the waiter's attention and I had to walk into the restaurant to ask for the bill or any additional request. That was rather frustrating. Nonetheless, I got a picture of the indoor ambience from their website. $18.90 for a wide spread. My friend had this dish and I managed to try some of it. Well, it does look appetizing with great colour combination that would definitely brighten up my day. On top of that, nothing beats having nice warm scrambled egg or poached egg or hard boiled egg, basically any kinds of cooked eggs for breakfast. However, the scrambled egg was too runny for my liking and a tad bland. The hash-brown and sausage were average, while the bacon were overcooked and too dry. Nonetheless, the sauteed mushrooms were flavourful and fresh. Conclusion: Overall good spread and held its name of "BIG Breakfast" but not a dish that I would order again. 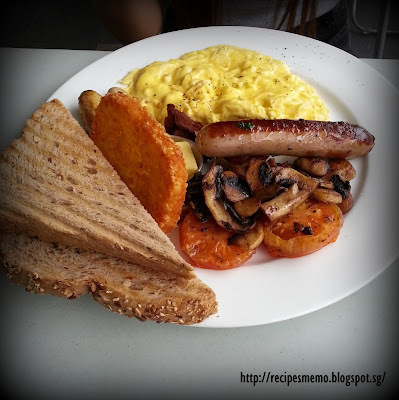 Comparing it with other "All Day Breakfast" cafes that I have tried, I would rate it 2.5/5. $14.90 but you could order the set meal (can't recall the price). I had the lunch set meal which includes a main to choose from, soup of the day and a drink. I decided on Bangers and Mash-two German Bratwurst pork sausage atop Real Mash. 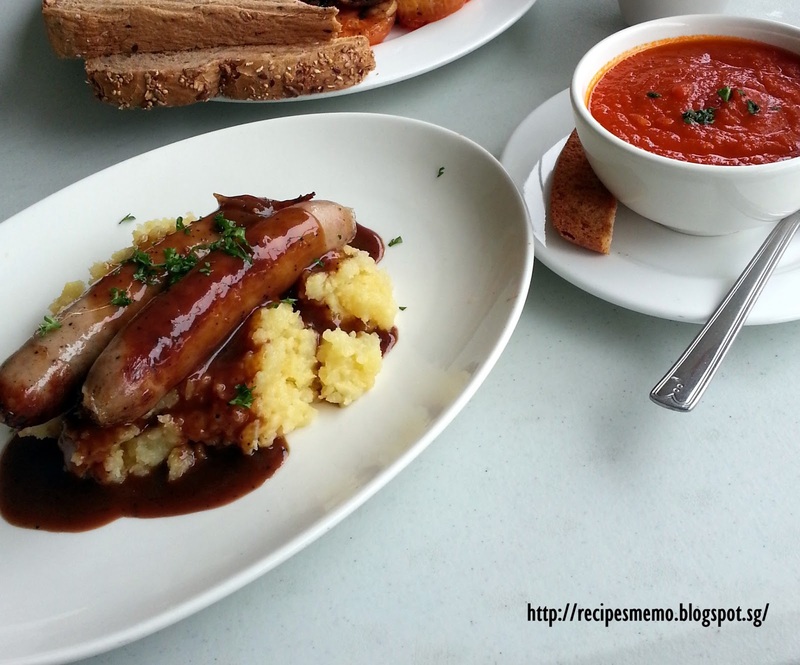 I am a fan of bratwurst sausages but the excellent mash made it a whole lot tastier. The mash was of the right texture and thickness, and the sauce was strong but not overpowering. I thoroughly enjoyed my dish. Conclusion: The Bangers and Mash and tomato puree soup were excellent and I would definitely go back for more.I can still vividly recall the taste of the mash even after 1 month. I would give the Bangers and Mash 4/5 and 5/5 for the tomato puree soup. Recently found back my passion for cooking and baking. However, it goes along the lines of healthy cooking! :) Hope you enjoy the recipes and feel free to ask any questions. On a side note, I am an avid animal lover who owns a Cocker Spaniel, Golden Retriever and a rabbit.